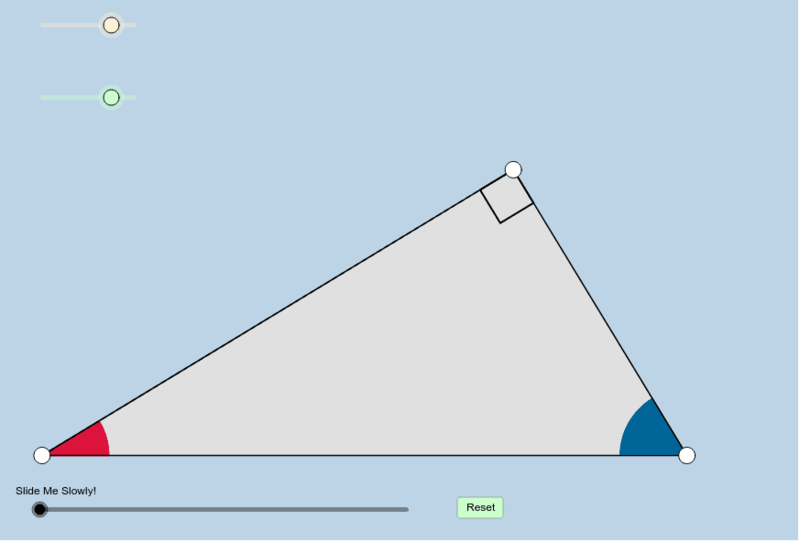 This resource is an enhancement of Similar Right Triangles (V1)﻿. Thank you to Karen Campe﻿ for providing suggestions for improvement! Students: Interact with the applet below for a few minutes. After doing so, please answer the questions that follow. You can move the LARGE WHITE VERTICES anywhere you'd like! What is the sum of the measures of the red and blue angles? How do you know this to be true? The segment that was drawn as you dragged the slider is called an altitude. This altitude was drawn to the hypotenuse. How many right triangles did this altitude split the original right triangle into? What does the the special movement of the red and blue angles imply about these 2 smaller right triangles? What previously learned theorem justifies your answer? Does your response for (3) also hold true for the relationship between the ORIGINAL BIG RIGHT TRIANGLE and either one of the smaller right triangles? If so, how/why do you know this?